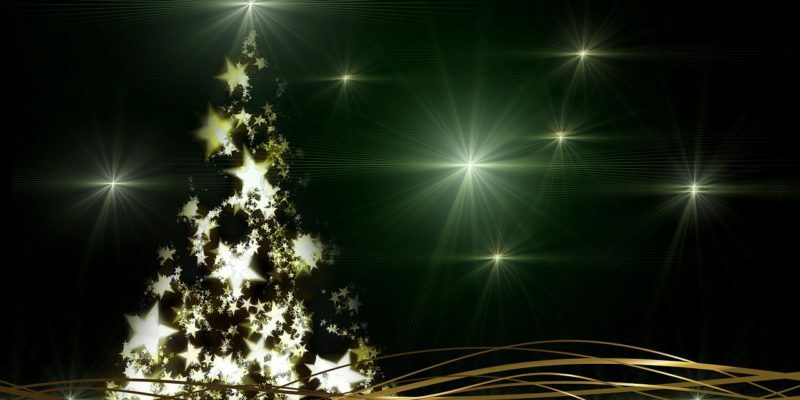 When creating your festive decorations, don’t forget to look up. 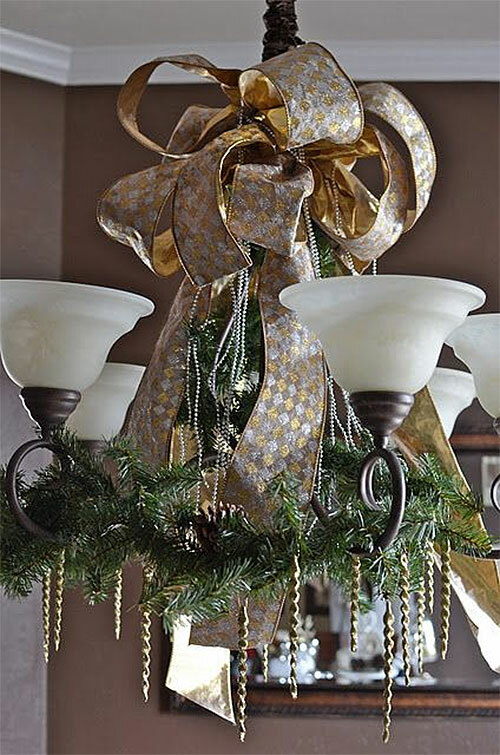 Through the creative use of ribbons, bows, garlands, ornaments, and more – your everyday chandelier can be transformed into a stunning Christmas masterpiece. 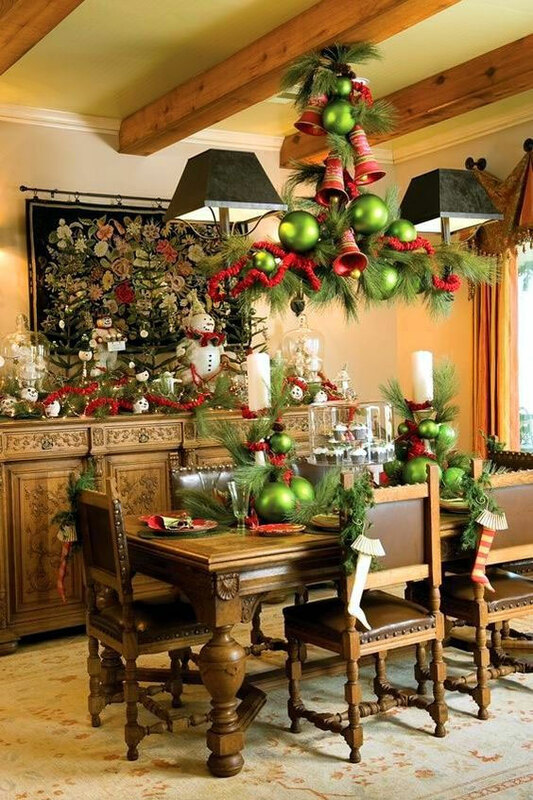 Beautifully decorated Christmas chandeliers add a unique and delightful touch of holiday spirit to a home quickly and easily. 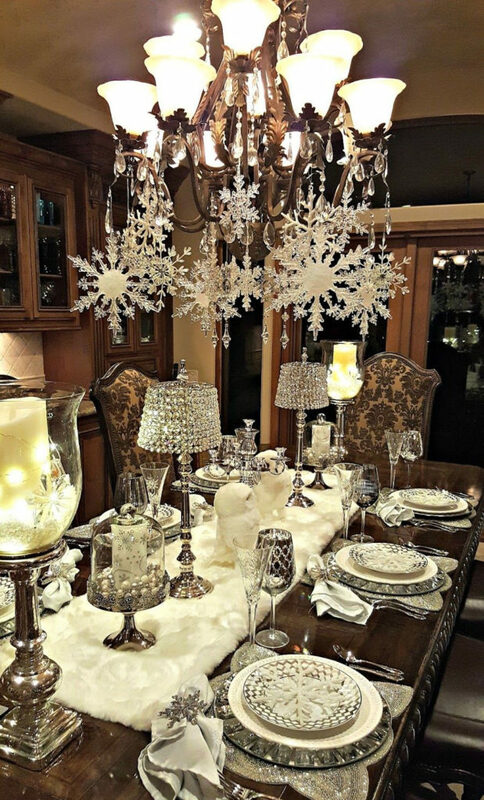 Here are just a few (ok… maybe more than a few… but it’s hard to contain myself sometimes) examples of exquisitely decorated Christmas Chandeliers. 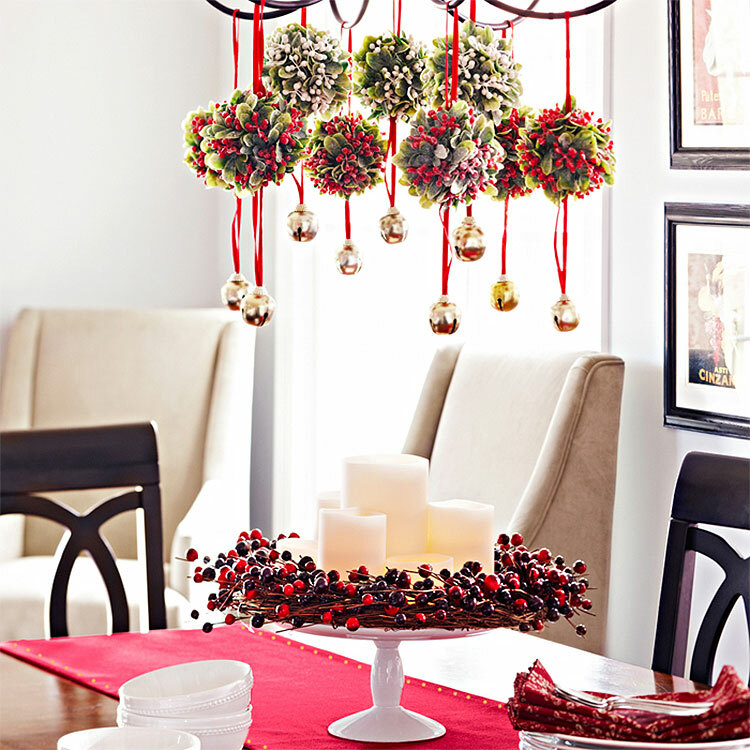 The rustic black & crystal chandelier creates a dramatic backdrop for the colorful Chrismas ornaments, creating a colorful display. 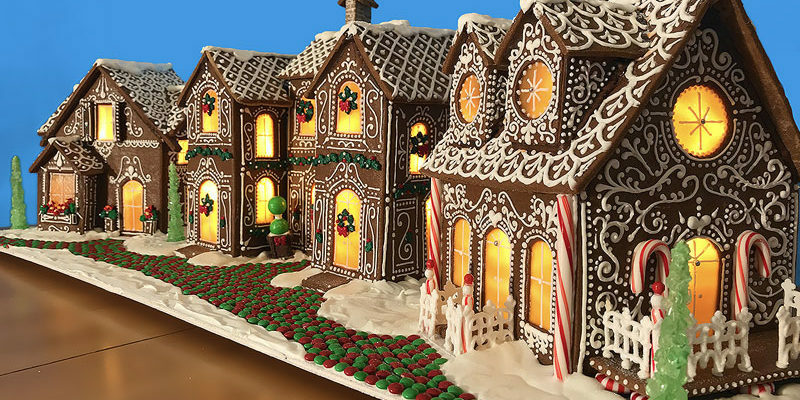 The colors in the decorations match the flashing on the ceiling, which adds an extra layer of fun. 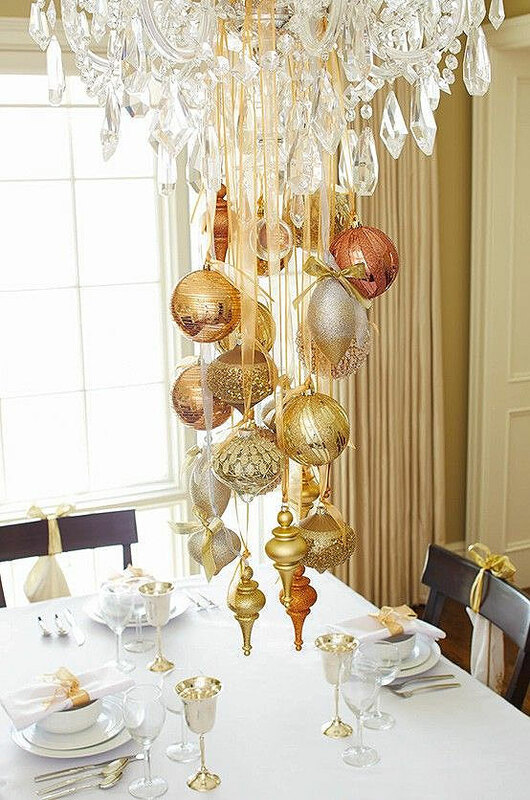 A collection of gold Christmas ornaments are strung on silky white ribbons to create an elegant extension to the existing light fixture. Of course, one of the downsides of this design is the number of times you show up in the picture you take of it. I count 11 times, but I might have missed one. 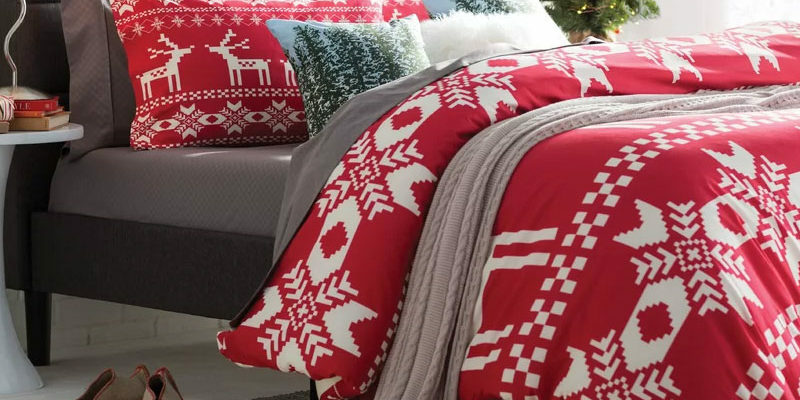 Pine, pine, and more pine. 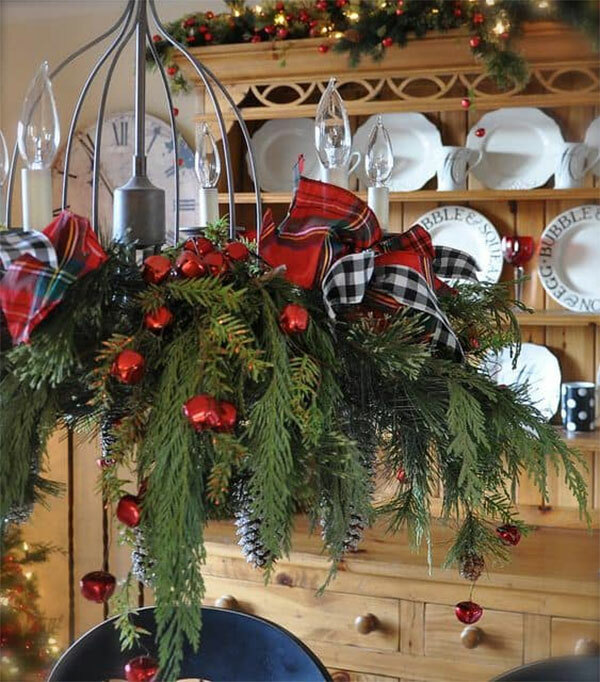 Simply keep adding elements of pine until you’re happy with the results and then finish it off with a few red berries and plaid bows. 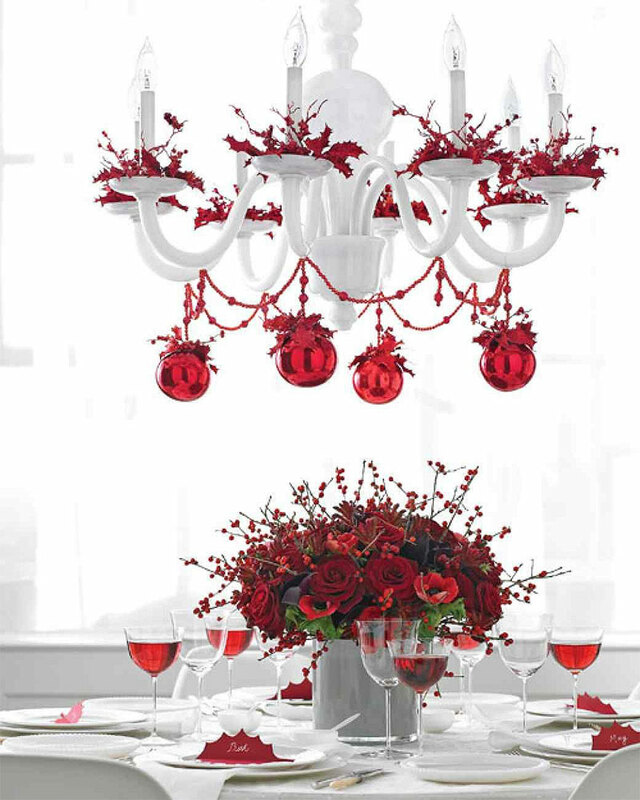 Part of a beautiful Red & White table, this red and white chandelier is deliciously striking! 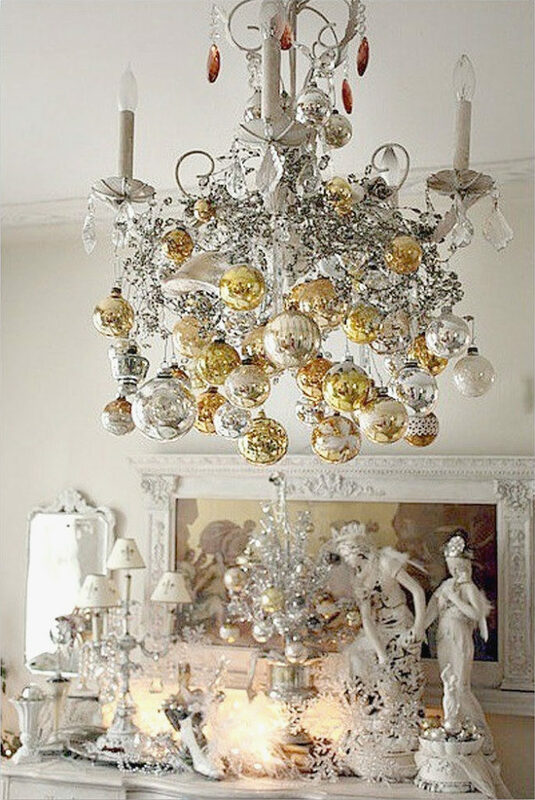 A very glamorous Christmas-inspired hanging light featuring gold and silver ornaments that positively sparkle! 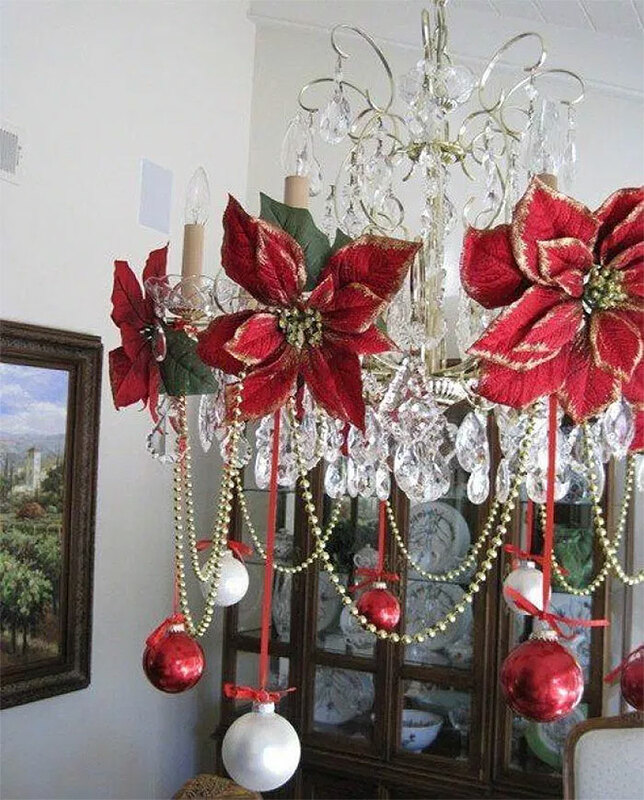 Red and white Christmas ornaments, gold beads, and delightful poinsettia clips are used to festoon this crystal chandelier. 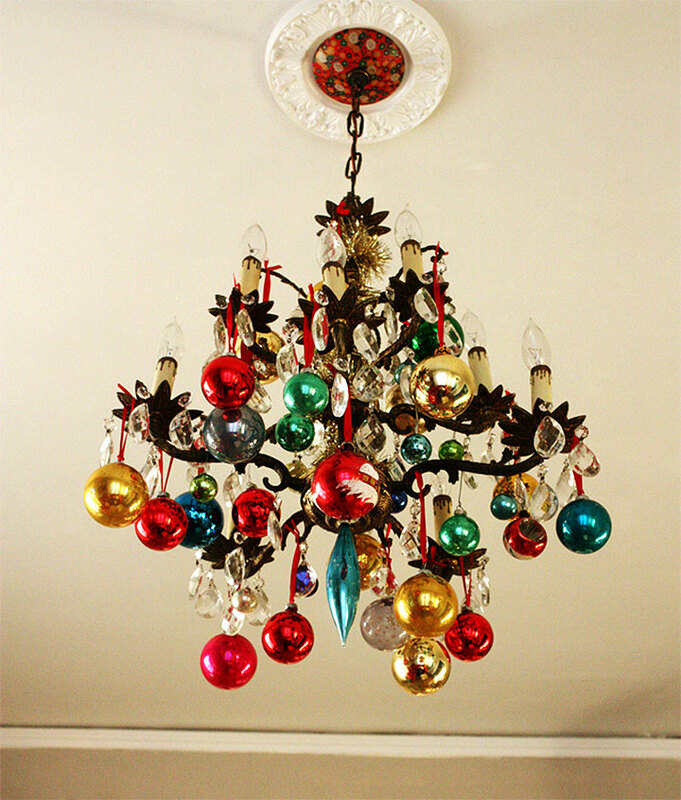 Cool Christmas colors adorn a sophisticated Christmas chandelier. 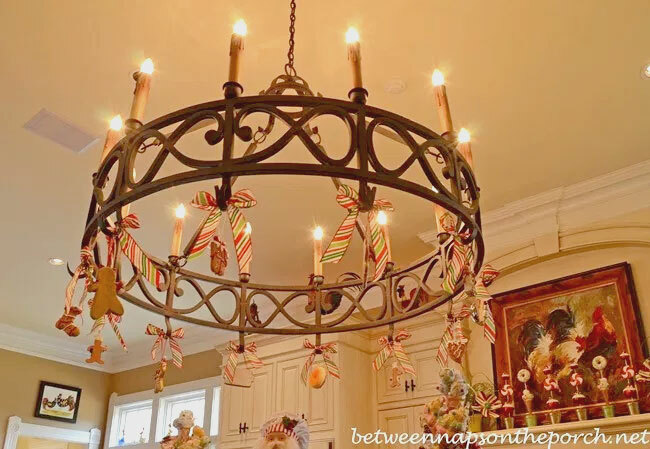 Using some ribbon (whatever color you choose), you can suspend a twig wreath around your existing light fixture to create a dramatic Christmas display. 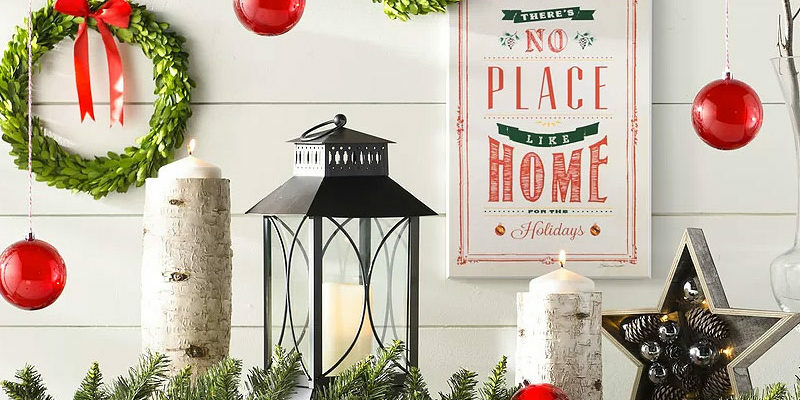 A black and white iron hanging light is giving a festive makeover through the addition of some green garland, red ribbon, and silver ornaments. 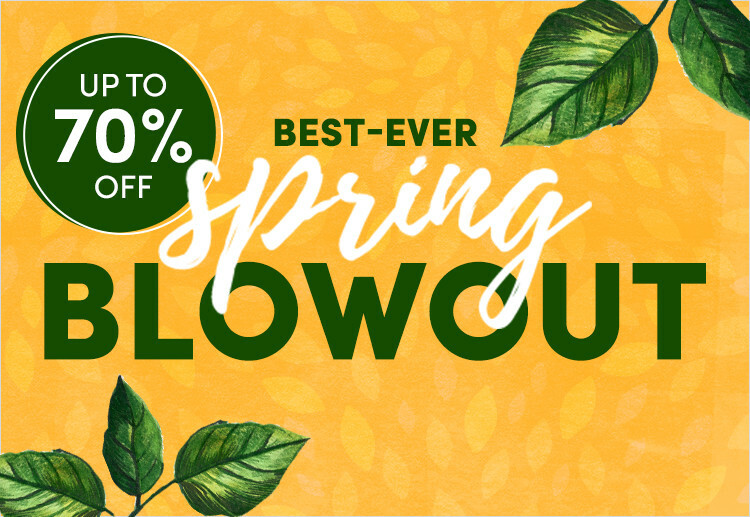 Try saying THAT three times fast! 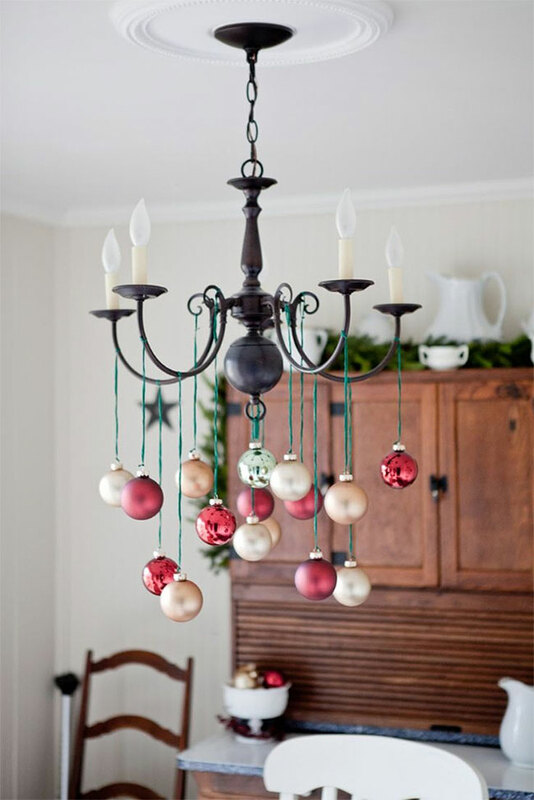 A simple, inexpensive, but delightful seasonal update to any hanging light fixture. 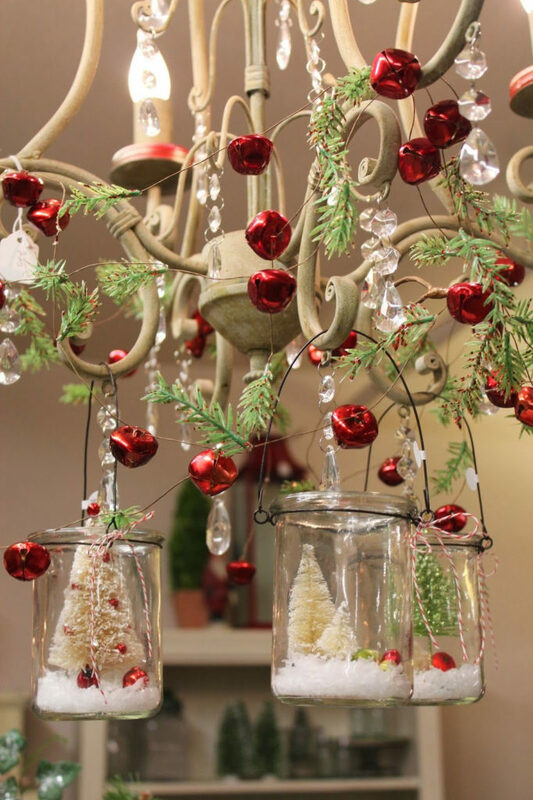 A mix of Red & Gold Christmas ornaments are suspended by green ribbon. So easy. So effective. So quaint. 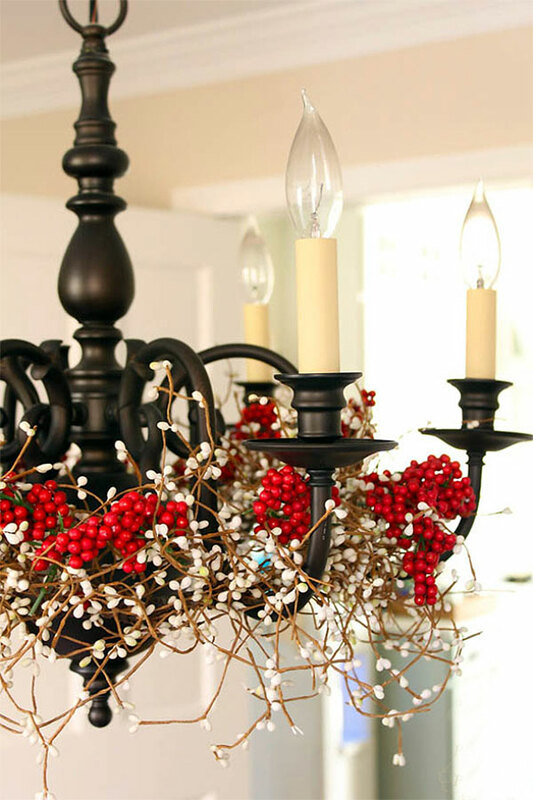 Berries are a fairly common theme for adding some holiday decor to your light fixture, and this is no exception. 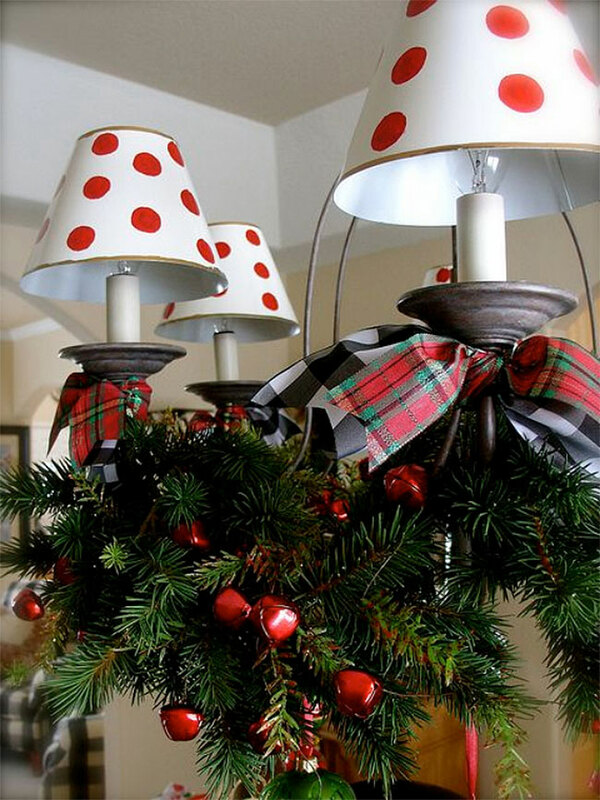 A charming mix of garland, red jingle bells, red & green plaid bows, and hand-painted red polka-dot shades at a touch of Christmas charm to this light fixture. 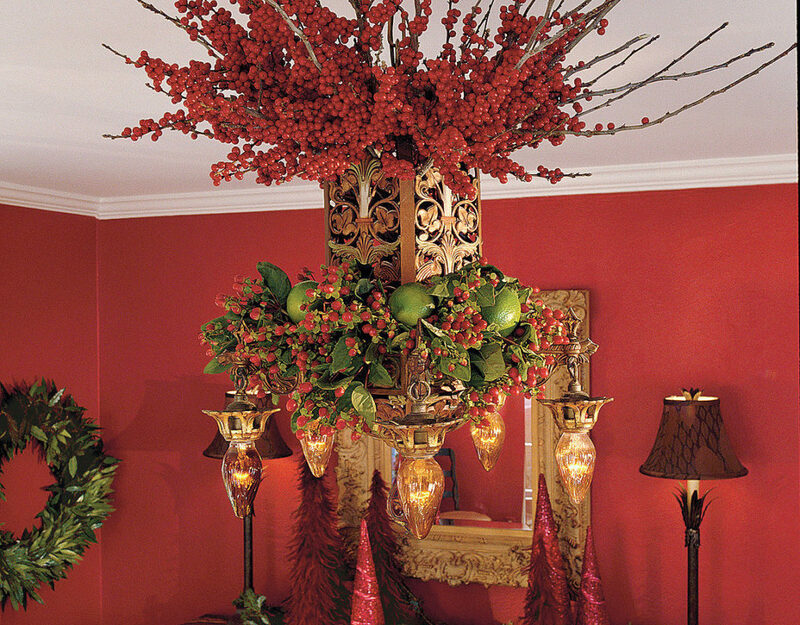 A pair of elegant chandeliers are given a festive update through the clever use of garland and red Christmas ornaments. Side Note: Love the birch bark vases! 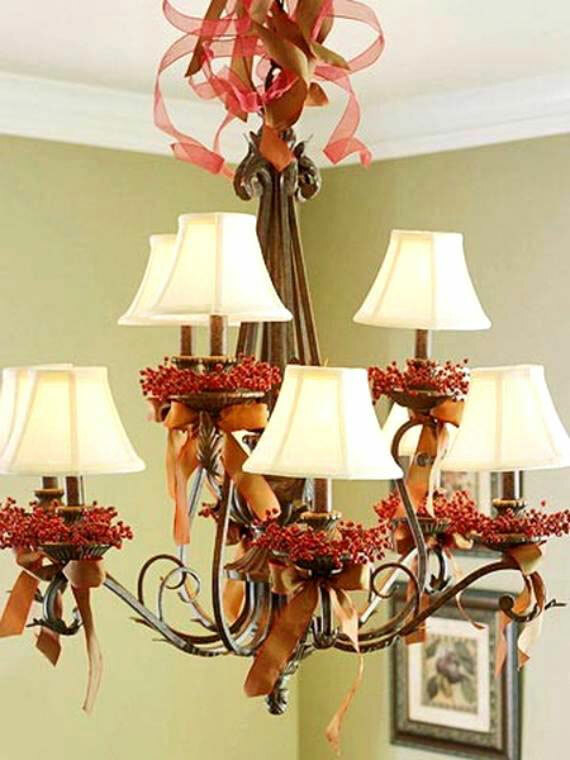 The glass holly berries add a subtle but delightful touch of seasonal decor to this rustic chandelier. 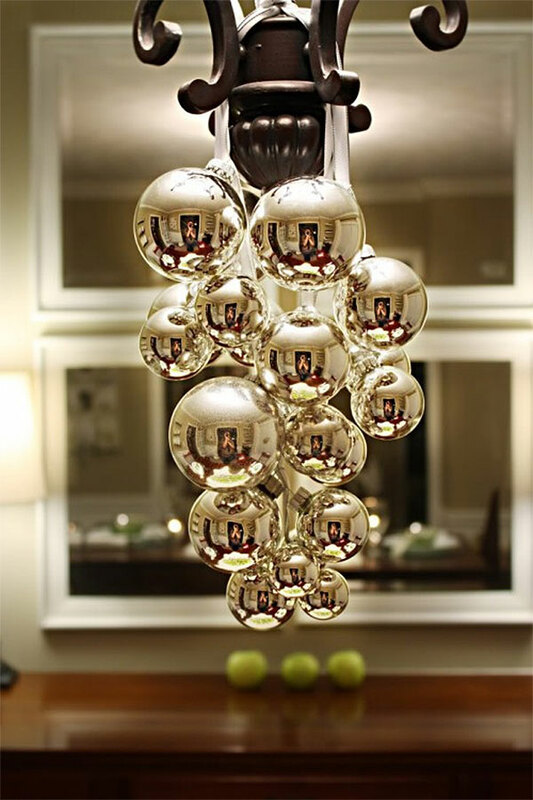 As you can see from this lovely Christmas Chandelier, it does not take a lot to give your everyday light fixture a Christmas makeover. 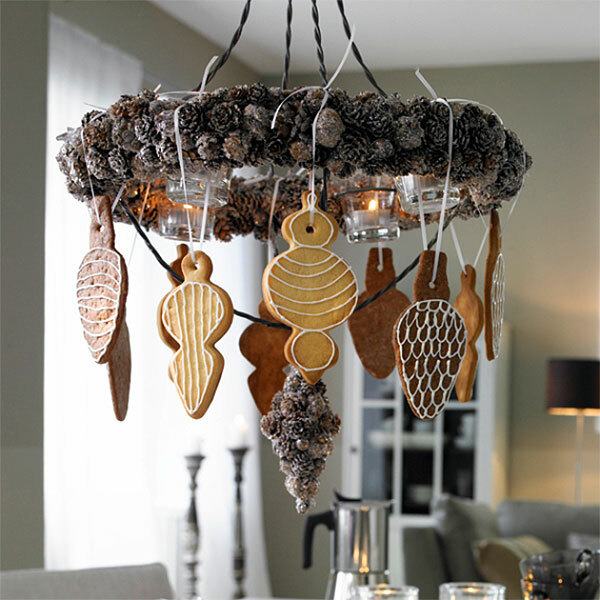 As an aromatic choice, a pinecone wreath and fresh baked Gingerbread cookies creates a Christmas chandelier that smells as good as it looks…. and is edible (parts of it) when the season is over. 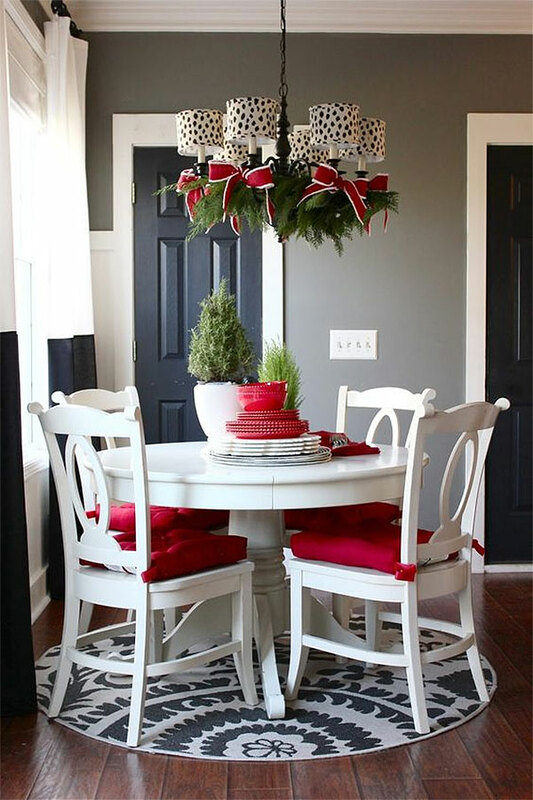 This decorated Christmas Chandelier from Between Naps on the Porch looks good enough to eat! 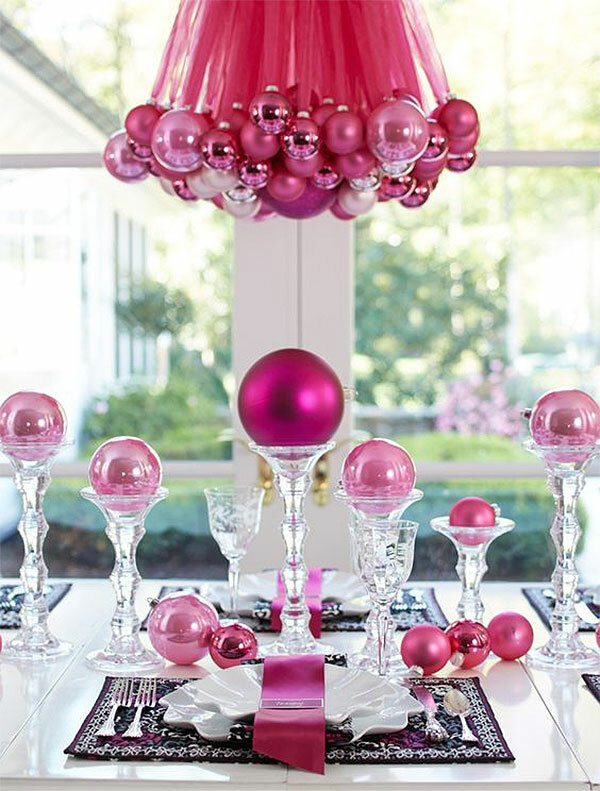 Sheer pink ribbons and various shades of Pink Christmas ornaments are used to create a dramatic display above the dining table. 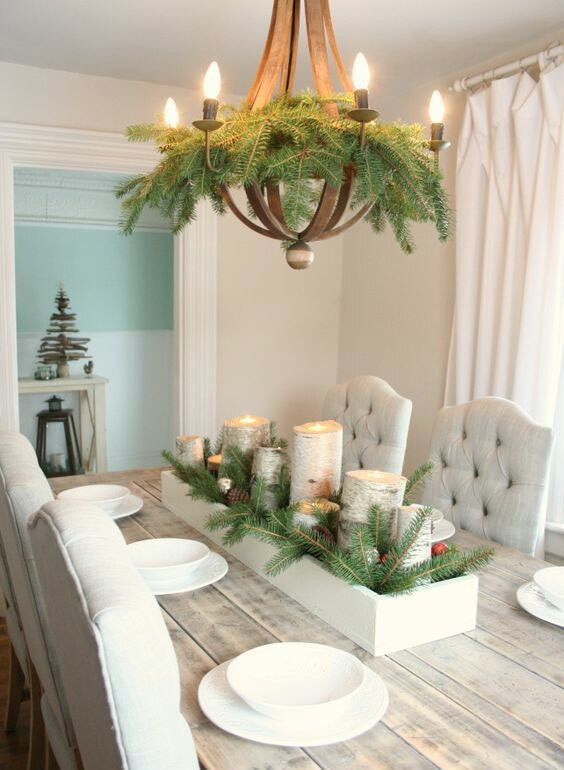 Perfect for the country Christmas table. 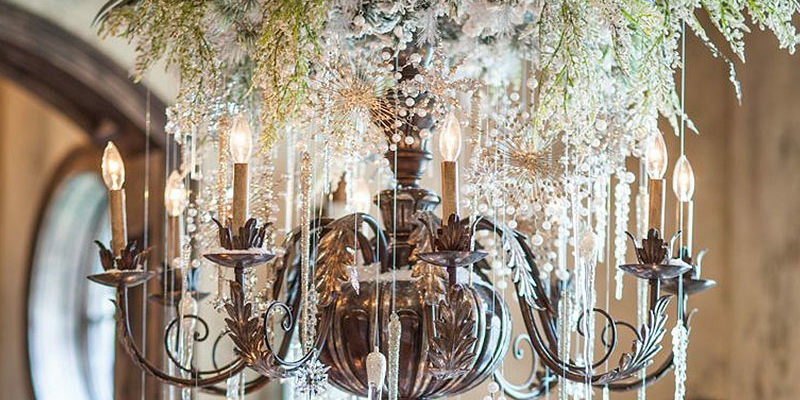 A mix of greenery at the top of the chandelier creates a wonderfully spray from which delicate glass snowflakes & icicles are suspended. 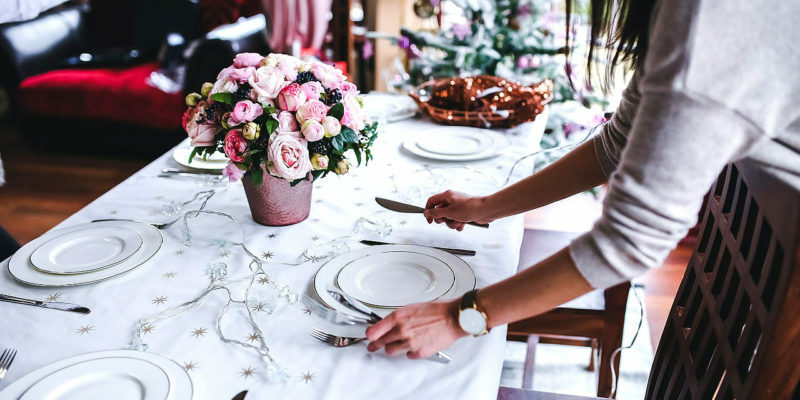 The entire grand French Country decoration is perfect for an elegant Christmas dinner. 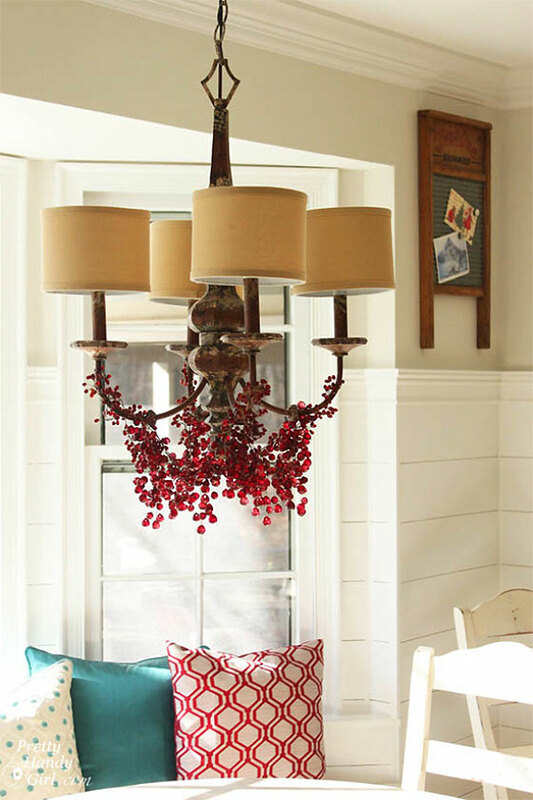 So simple, yet so effective, this rustic iron chandelier is given a charming Christmas makeover through the addition of some red & white berries. The result is an absolute delight! From one end of the Berry spectrum to the other! 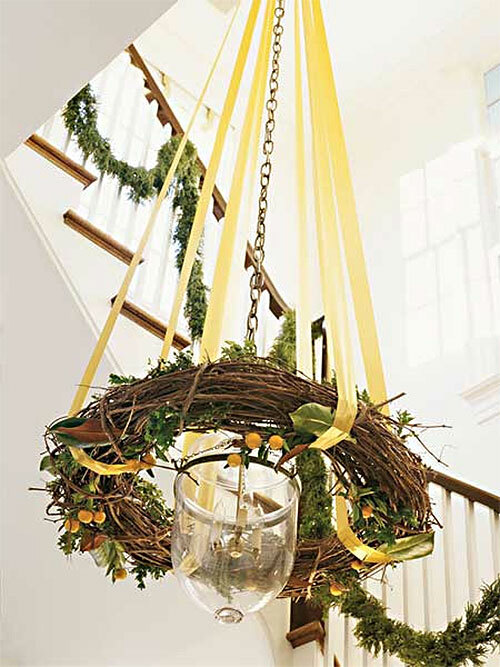 One of the more intricate Christmas Chandeliers on our list, florist wire is used to attache groupings of berry branches to the center of the chandelier. The wiring is then covered with more berries and greenery. 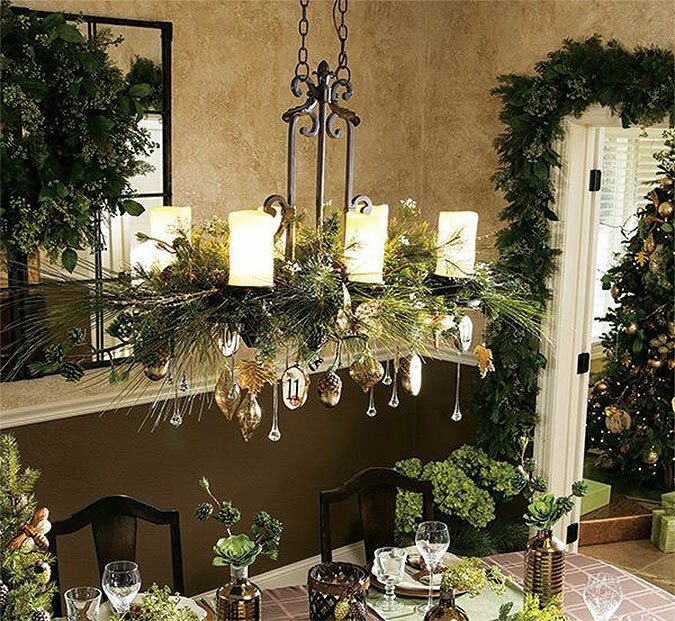 This version is crafted with living plants (including a few limes for good measure), so the display would last about 7 to 10 days, but you could do the same with artificial stems for a longer lasting Christmas chandelier. 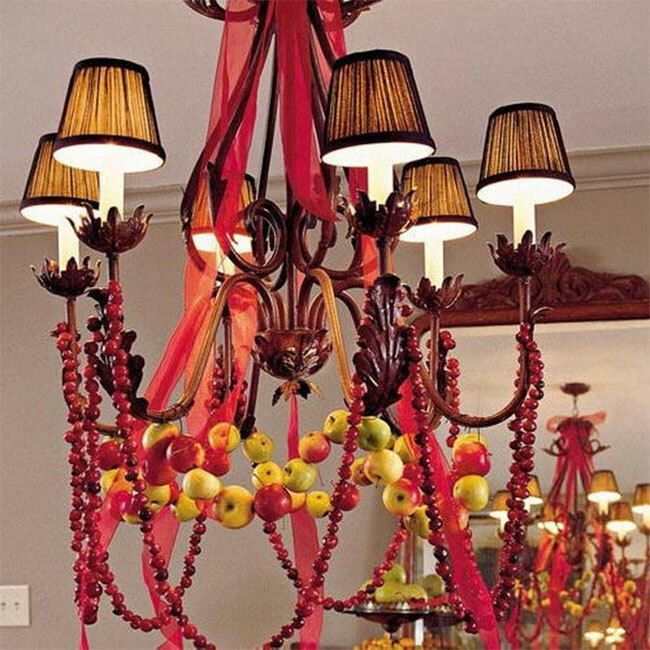 A string of Winter apples and a string of cranberries create a rustic yet festive chandelier. 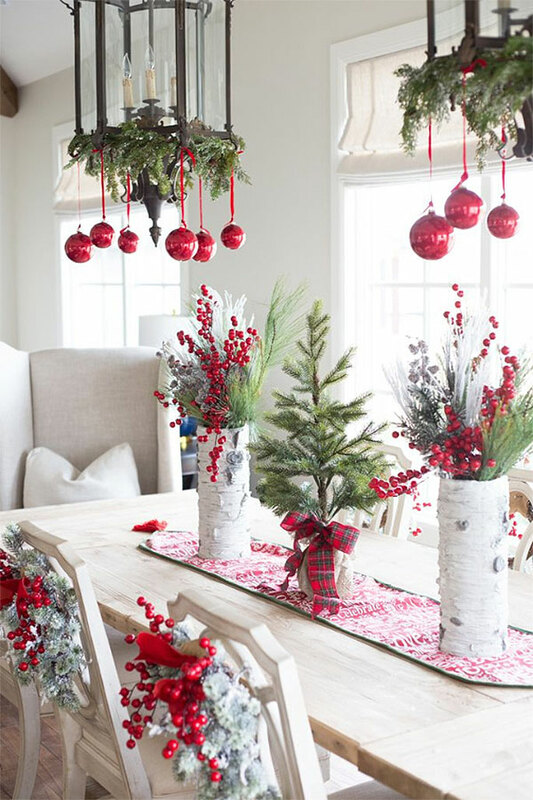 This chandelier gets a Christmas makeover with some delightful touches of Christmas charm, from sprigs of pine to red Christmas bells to Christmas trees in suspended jars. The entire creation is quite delightful! 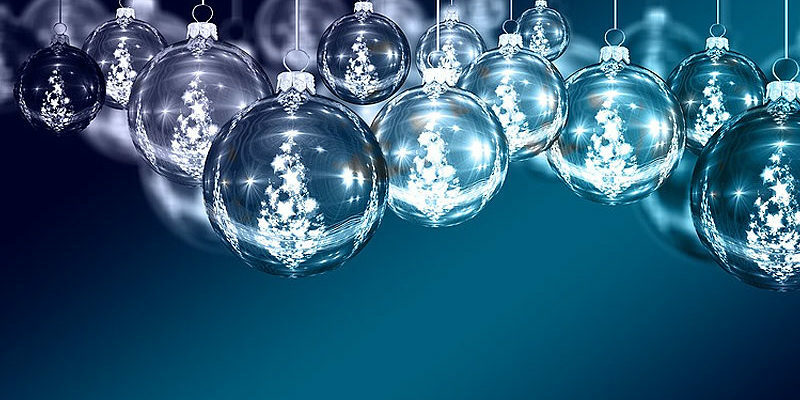 Goodness, gracious, great balls of Christmas! This must have taken HOURS to create, but it was worth it!! 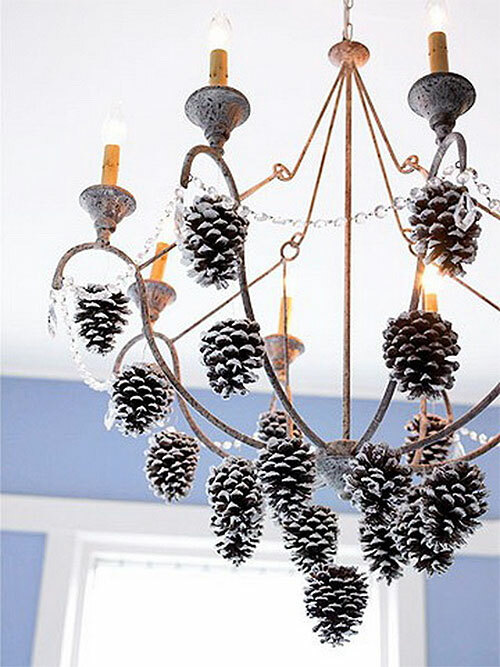 Country charm abounds when you add some live greenery, frosted pinecones, plaid ribbons and red Christmas bells to your chandelier. 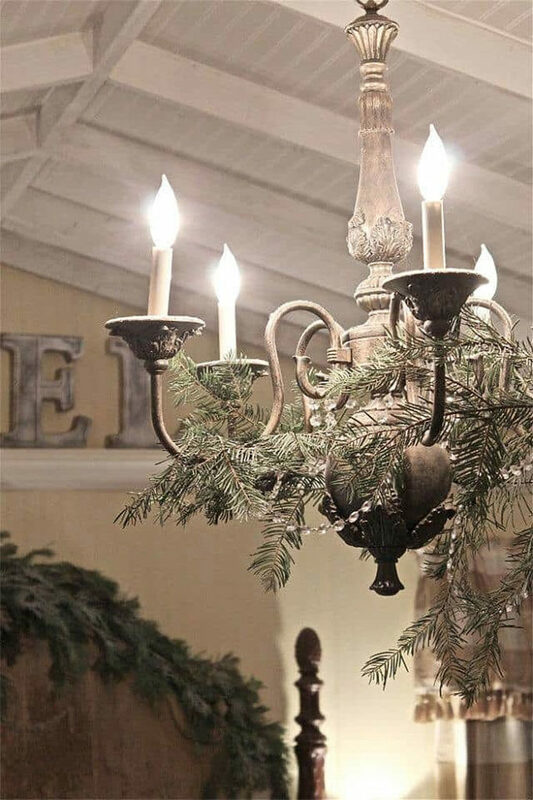 Don’t underestimate the impact simply adding some fresh pine branches can have to your everyday Chandelier. The result is elegant, understated, but still divine. 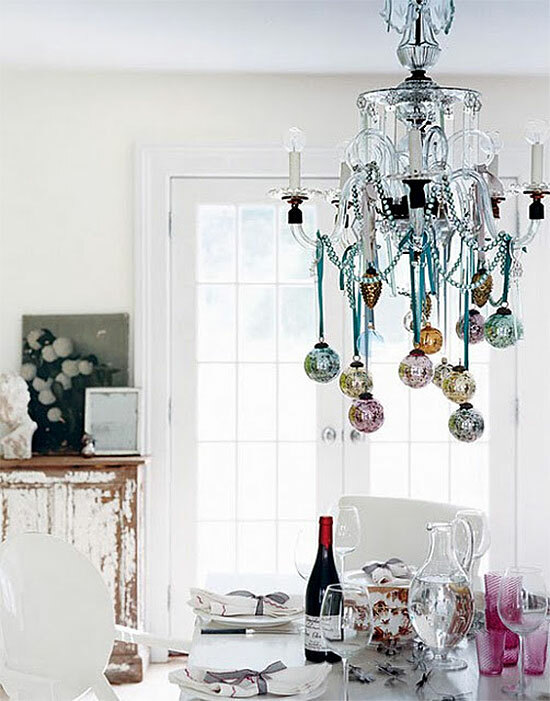 This crystal chandelier gets a truly elegant Holiday update that makes a statement. 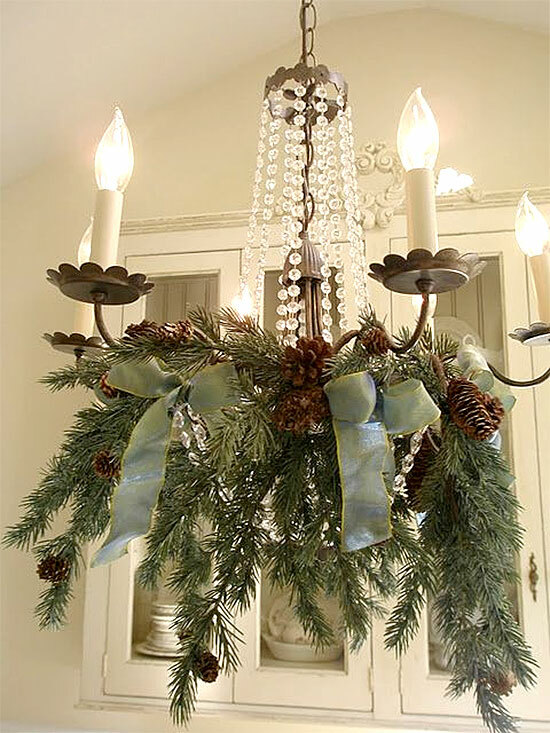 Use some pine branches to quickly and easily add a touch of Christmas green to your light fixture. 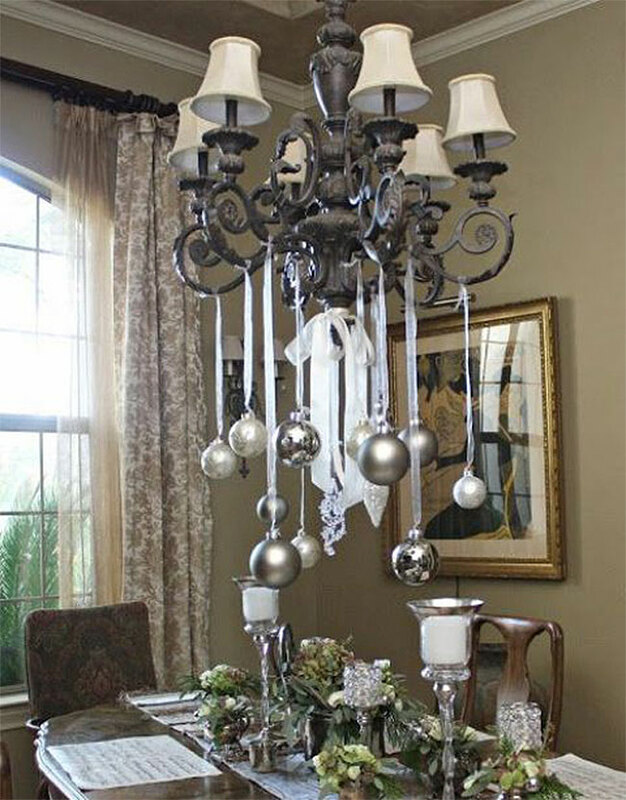 Silver ornaments hang from a beautiful baroque inspired chandelier, creating a dramatic display. 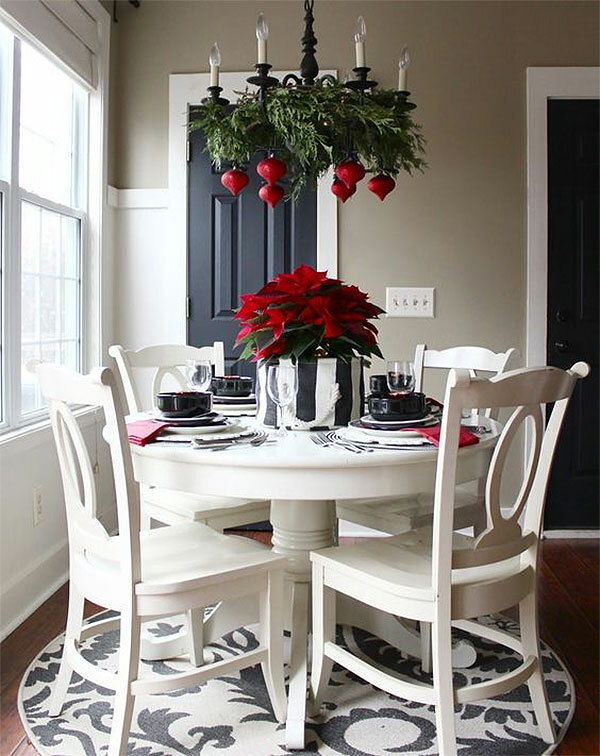 An otherwise black and white dining room gets a touch of Christmas color with some green garland and red ornaments. 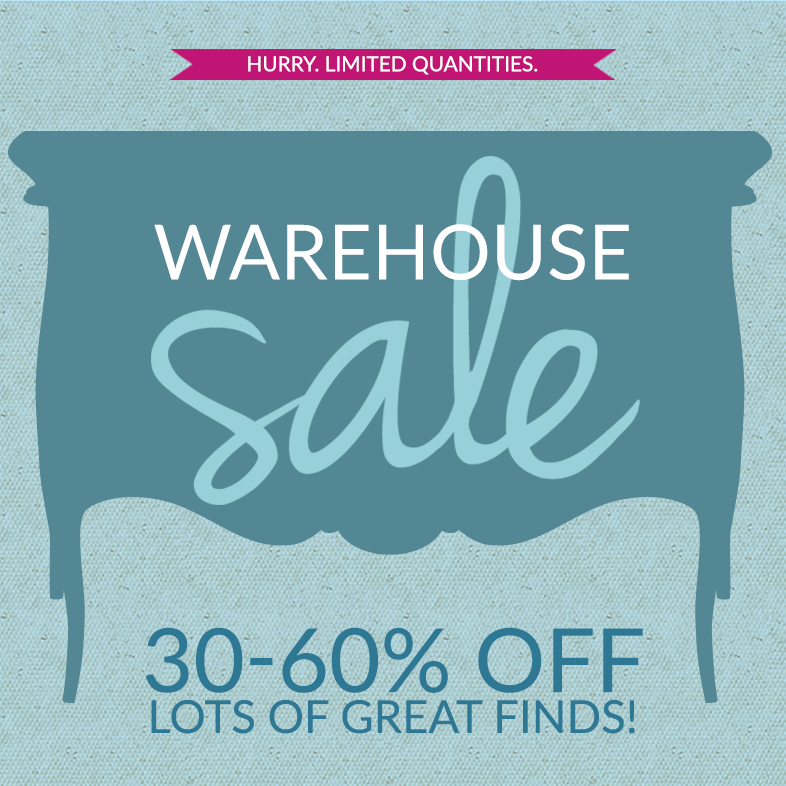 The same room, with a slight variation on the additional decorations to add a bit of fun to the decor scheme! 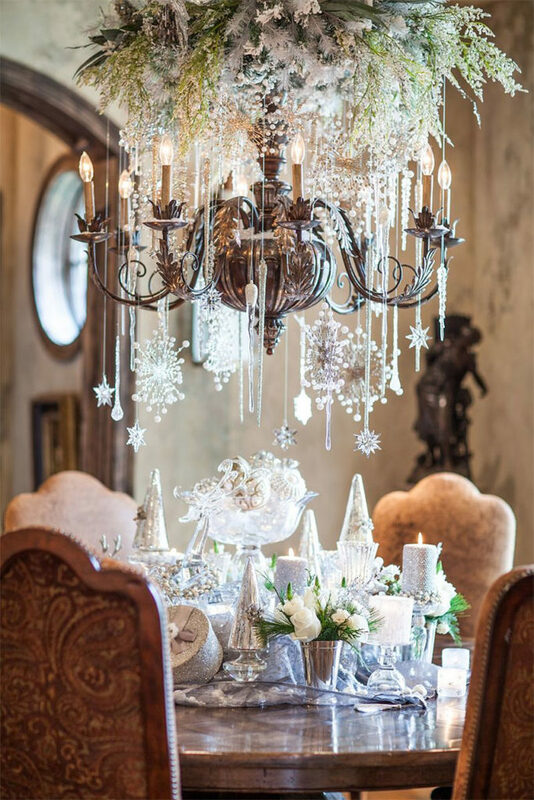 This french country chandelier looks resplendent with an array of snowflake ornaments. Beautiful! I also love the White Owls on the table, so unique and elegant! 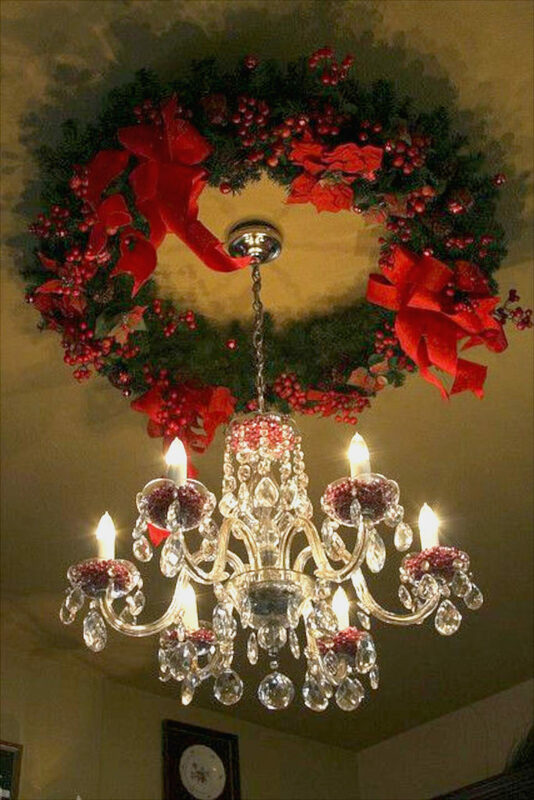 A large wreath becomes a ceiling medallion, creating a wonderful display. 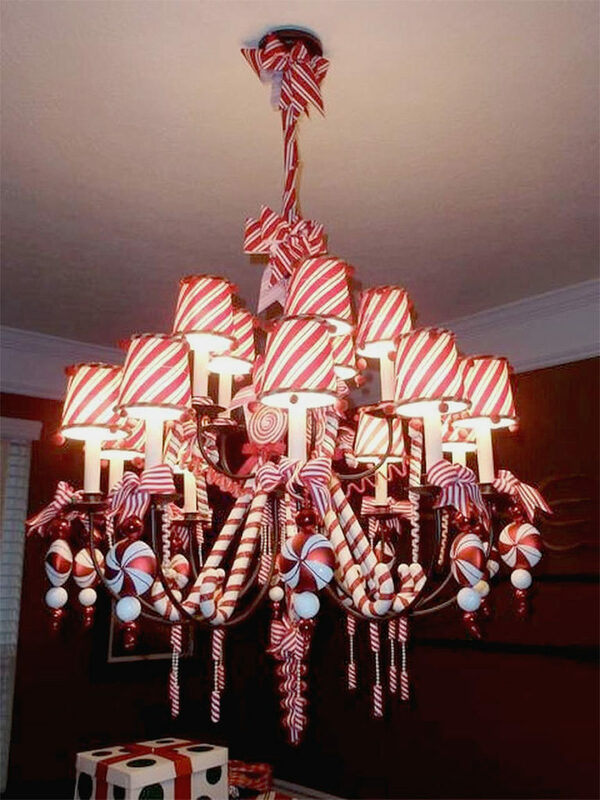 Additional red accents are added to the chandelier itself to complete the look. 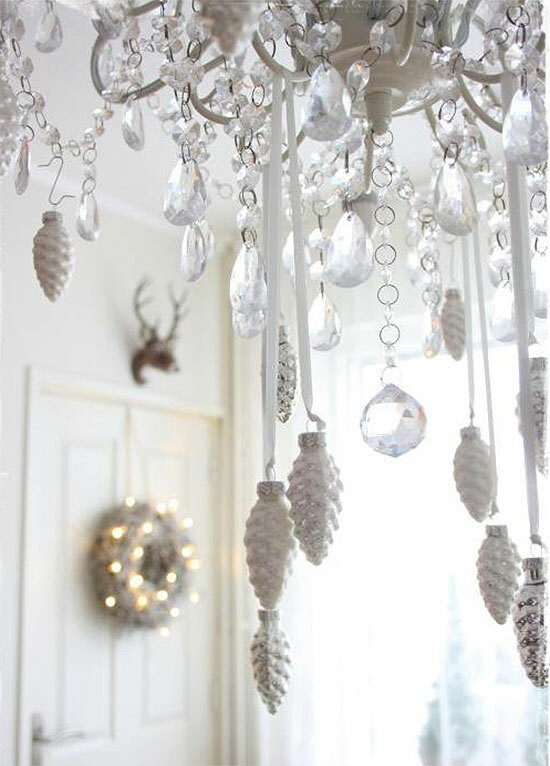 Simply elegant, in white and crystal, with some white pinecone accents delicately hanging from white ribbons. 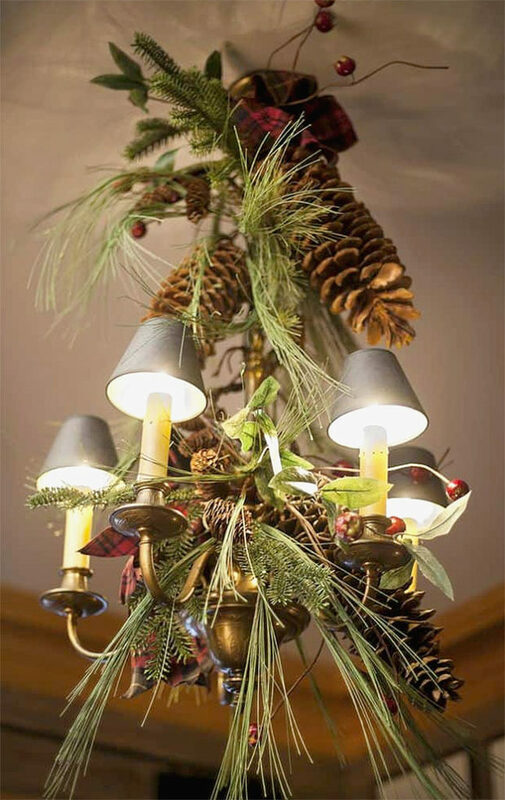 Continuing in the line of simple yet elegant, this light fixture uses pine branches, pine cones, and green ribbon to create a simple yet elegant display. 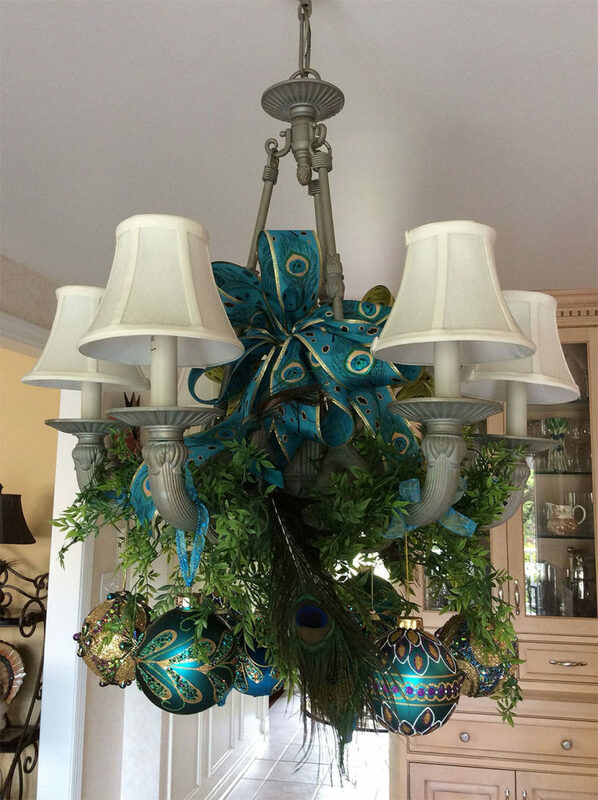 A big, beautiful bow adds a touch of wonderful charm to this decorated chandelier. 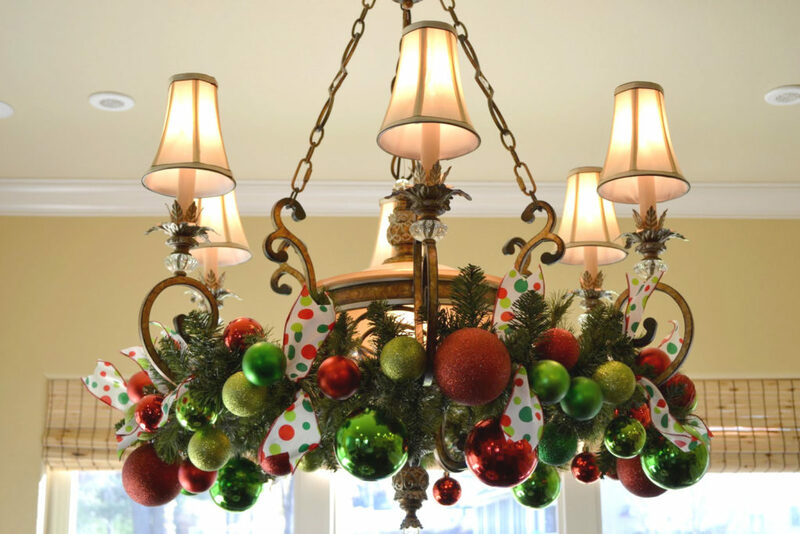 Oversized red Christmas bells and green ornaments wrap this light fixture in holiday spirit.